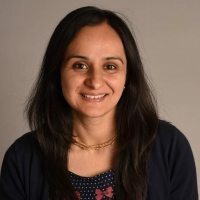 Nimarta is a senior research fellow working on the Implementation and Fidelity work stream in the Better Start Bradford Innovation Hub. Nimarta is a chartered psychologist. She completed a PhD in Health Psychology from King’s College London in 2013. Using mixed methods, Nimarta’s PhD explored the role of psychological, demographic and cultural factors in uptake of colorectal cancer screening in an ethnically and socially diverse area of South East London. Following her PhD, Nimarta worked as a research associate at the Manchester Centre for Health Psychology at the University of Manchester. Nimarta’s research interests focus on implementation science, evaluation of behaviour change interventions, health professional-parent communication, informed choice in cancer and newborn screening, improving access to health services and global health.